We will ask you to indicate you accept our Risk Declaration when you arrive for our activities. As with any sport/leisure activity there are hazards associated with Full On Adventure outdoor activities. It is important for the safety of everyone taking part that each participant is acquainted with those hazards and individually takes all relevant action to minimise those hazards as much as possible. 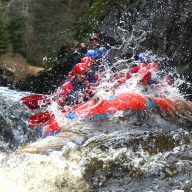 Outdoor adventure activities are physically and mentally intense and may require extreme exertion. The possibility of injury to myself exists. I may get wet and cold. Participation in our activities can cause bruising and stiffness. If I take off my equipment I will be putting myself in danger. If I don’t listen and follow the guide’s instructions I will be putting myself in danger. Moving water is dangerous and that ultimately there is a risk of drowning. Cars are parked at the owners own risk. 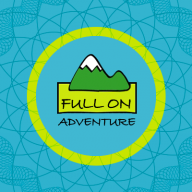 Full On Adventure does not accept responsibility for valuables lost or damaged during activities or at the activity sites. I am physically fit and mentally able to take the strain and exertion involved in the activities which I plan to undertake with Full On Adventure. I am fully aware of the risk to myself and others involved in these adventure activities. I will comply with the rules and use all equipment as instructed. I will obey all instructions from the guides. I will listen to and ask if I need additional explanation so that I understand the safety briefing. I accept the inherent risk of injury that all Full On Adventure outdoor adventure activities entail and waive any claim that may result from my participation in these activities. I am also aware of what clothing, equipment or food that I need to bring with me. We will ask you to indicate you accept this when you arrive for our activities. Parents will accept this on behalf of their children under 18 years old. For youth groups who bring under 18s without parents in attendance, we ask group leaders to check with parents first and ensure they are all happy for their children to participate in our adventure activities. Group leaders will sign this declaration of risk acceptance on behalf of themselves and all their group members, in the full understanding that they have undertaken to get the permission of all parents of the under 18s in their charge, to accept this risk declaration on their behalf and made parents aware of this risk declaration in advance of attendance. Towel, trainers are worn on water and will get wet so bring spare dry ones and socks. For river kayaking bring same as listed here for Rafting. For canoeing we recommend waterproofs such as you would use for hill walking, as it is easier to regulate your temperature in a front zipped mountain type jacket than in one of our canoe cags. Canoeing can be a mainly dry experience so often regular clothes are much more suitable than one of our wetsuits. 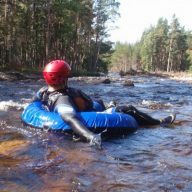 If you prefer a wetsuit we can easily supply you with one and for more white water sections we might recommend it. Wetsuits are provided with cags, so just bring stuff for under or over that, based on likely weather. Swimming costume or shorts, towel, shoes will get wet so bring spare dry ones. We provide the skis/boards, poles and boots so you need everything else. We always recommend for Scottish skiing, waterproof good jacket, waterproof trousers, 2 warm hats and gloves (2 hats in case one blows away). Goggles cannot be hired anywhere so bring your own or buy them on the day from the hire shop, cheap orange lens goggles are fine. It can be very unpleasant if not impossible to ski / board with out goggles at times. sun glasses are unlikely to be enough unless you get really good weather. We provide everyone with Full Wetsuit, Wet Suit Socks and Wetsuit shoes (but we recommend you bring your own old trainers to wear over our socks, as more comfortable). We also provide gloves, buoyancy aids and helmets. So just bring along a large towel for changing and drying, swimming costume or shorts, old trainers that will get wet (optional) and sport base layer / thermal base layer for under the wetsuits and any other layers you might like for comfort if cold weather like thin thermals (optional).